Halloween is behind us. Which offers me the possibility to not talk about dominant central banks, for once. Even though, we now know who the new Fed chair will be and that rates are going up again in December. Let’s focus first on November, traditionally the month in which the party on the stock markets really starts. History speaking, that is. 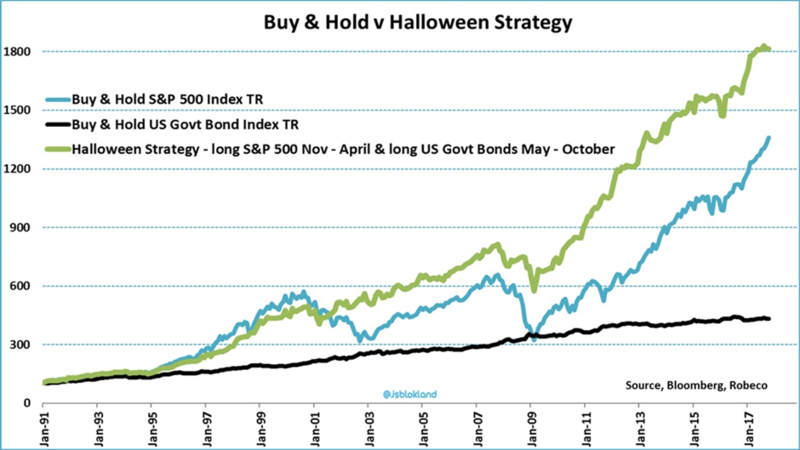 But the ‘Halloween effect’ goes beyond equities. 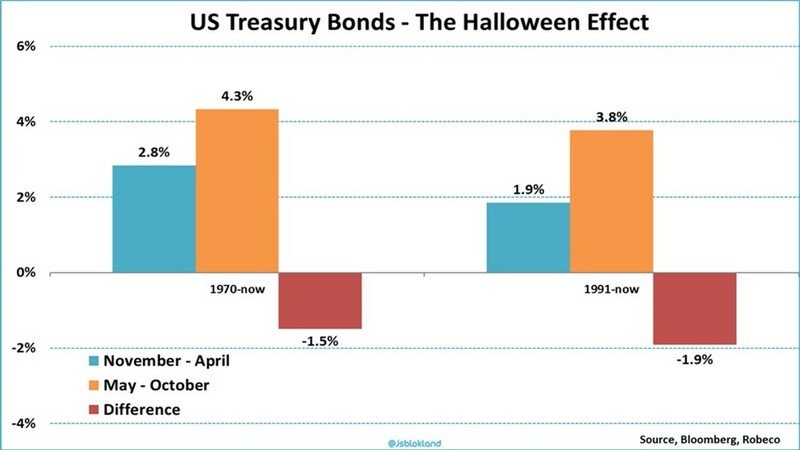 Government bonds ‘suffer’ from Halloween as well, which paves the way for a very profitable investment strategy. 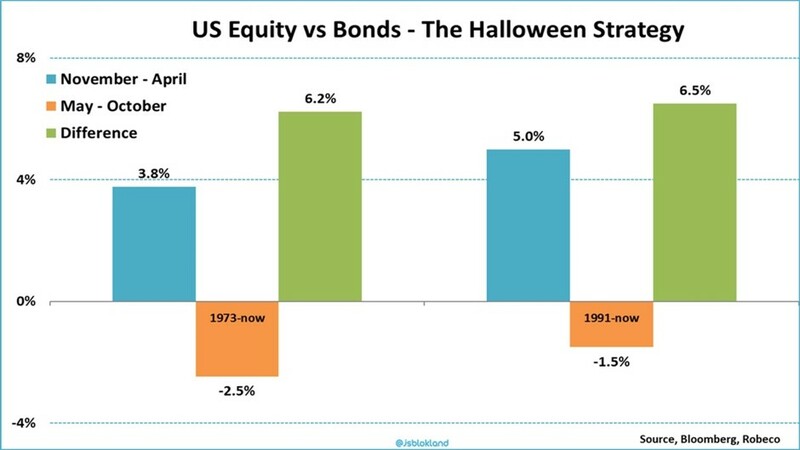 The Halloween effect, aka known as the Sell in May effect, refers to the market anomaly that pretty much all of the return on stocks is realized in the months November through April, while there is little return to be made from May through October. 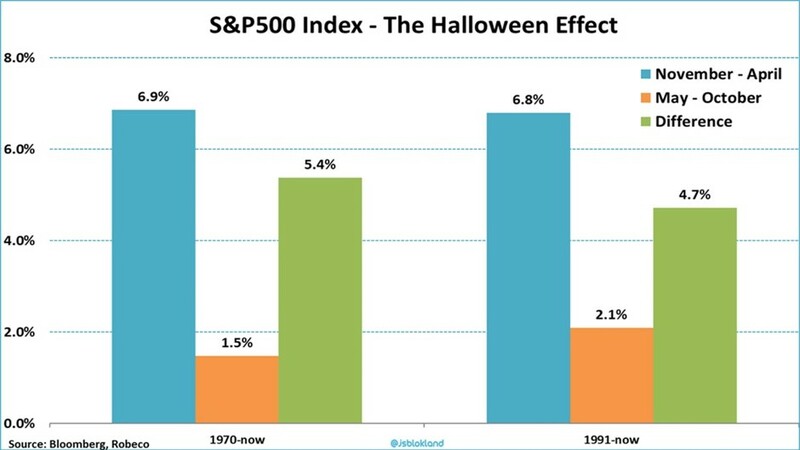 The graph below shows the Halloween effect for US stocks since 1970 and 1991. It reveals that the return on the S&P 500 Index is much higher during the ‘winter months’, November – April, than during the ‘summer months’, May – October. US stocks do realize a positive return during the summer, but it’s far from great, especially if you take into account risk. The world doesn’t revolve just around the US. 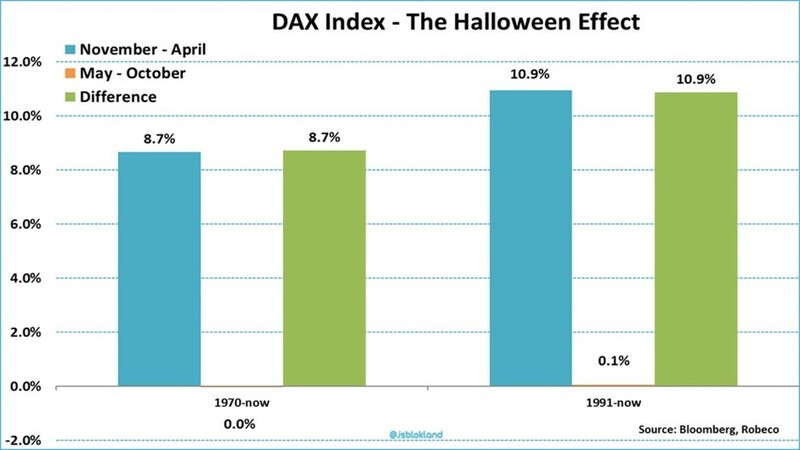 The graph below shows the Halloween effect in Germany, which is much more explicit than in the US example. All of the return on German equities is realized in the winter months. You could have sold all of your equities holdings in May, and taken a nice long summer holiday without giving up any return. But it gets even more extreme than this. In Japan, you must get out of the market before summer arrives. The return between May and October is outright negative. If anything, you should short Japanese equities during summer. Most empirical research on seasonality effects stops at the conclusion that investing in equities is mostly a winter thing. But there is more. Seasonal return patterns can be found in the returns of other asset classes as well. Take for example government bonds. The graph below shows the return pattern for US Treasuries. What is striking here is that the seasonal return pattern is opposite to that of equities. November through April yields a lower return than the return on bonds during the summer months. And, if we go back to the first graph, we will see that during summer bonds also beat stocks. Since 1973, unfortunately my Bloomberg return series does not go back all the way to 1970, US Treasuries beat US equities by 2.5% and by 1.5% since 1991. Again, this pattern is not just visible in the US. Bonds outperform stocks during summer months in other countries as well. Obviously, conclusions based on historical data shouldn’t be extrapolated into the future, automatically. 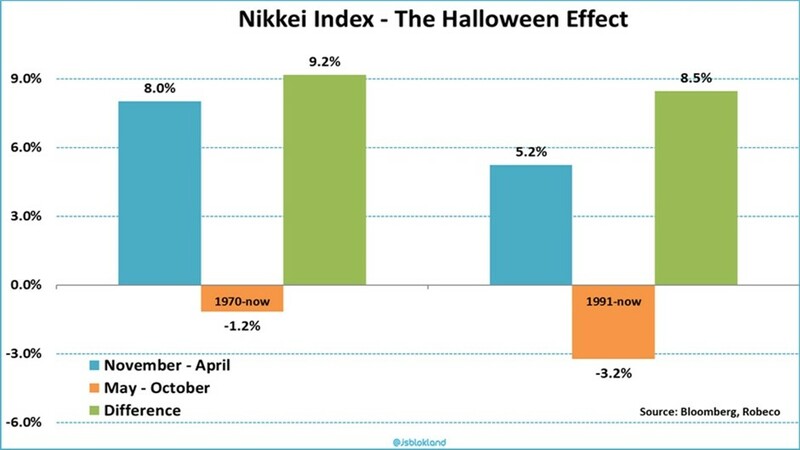 First, the Halloween effect prevails in roughly two out of every three years, on average, hence not every year. Second, there are many other factors that impact returns. Just a few examples are politics, the bursting of bubbles, and extreme policy measures implemented by central banks. Neither one of them cares about which month it is. Having said that, I do believe that the Halloween effect will be with us going forward. The main argument is that seasonal return patterns are likely explained by behavioral factors. Especially the ‘optimism cycle’, as described by Doeswijk (2005) offers a plausible explanation. Towards year-end investors start to focus on the next calendar year, often with their hopes up too high. People are intrinsically overoptimistic, which is also reflected in the stock market. But as the new year progresses investors have to lower their expectations, with a dampening effect on stock prices as a result. Doeswijk underpins this assumption by showing that earnings expectations of equity analysts follow precisely this pattern. And if one thing has become clear in recent decades, it’s that changing (investor) behavior is virtually impossible. Let’s see if we have another ‘warm’ winter on the stock market this year.